A culmination of Drozdowski's eclectic and audacious musical career fusing psych, blues and garage into an exceptionally forward looking, sonically wild guitar fueled rave-up that also features deep storytelling and soul. Mighty Sam McClain guests. 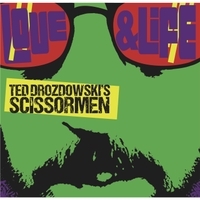 Psychedelic blues innovators Ted Drozdowski's Scissormen will release their sixth album, 'Love & Life,' on July 31st via the Dolly Sez Woof label. An exhilarating musical experience, 'Love & Life' is a culmination of Drozdowski’s eclectic and adventurous musical career, fusing psych, blues, and garage rock histories in an exceptionally forward-looking, sonically audacious collection. A protégé of R.L. Burnside, Drozdowski sat in with the legendary bluesman multiple times before his passing and expands on his vision here. The album's eleven new tracks find the bandleader at his most electrifying, as scorched, layered guitars drip with distortion underneath his open-throated voice. Legendary soul singer Mighty Sam McClain and GRAMMY-nominated organist/Bobby Rush bandleader Paul Brown make guest appearances on the album alongside the Scissormen, who have expanded from a duo into a lean, blistering trio over years of relentless international touring, including high profile stops at major festivals like Bonnaroo. The album will coincide with the release of a new e-book by Drozdowski, who is also an award-winning music journalist and educator, titled Obsessions of a Music Geek, Vol. 1: Blues Guitar Giants. Drozdowski has a gift for painting vivid lyrical portraits, with characters ranging from old bluesmen and coal miners to sinister ghosts and the devil himself. On "R.L. Burnside (Sleight Return)," he recounts a visit from his musical mentor, while "Watermelon Kid" pays homage to Watermelon Slim. "Beggin' Jesus" battles with temptation, "The River" takes a spine-chilling journey to the banks of the Tallahatchie River in north Mississippi, and "Black Lung Fever" ruminates on the disease that took the lives of both of Drozdowski's immigrant grandfathers before he was born. "I wanted every song on this album to tell a story and be deeply rooted in great American music," says Drozdowski. "I also wanted to apply more elaborate production techniques, like multi-tracking my guitars and treating them with multiple effects during and after recording, to create a broader, unpredictable sonic palette, and just plain get weird." Drozdowski recorded the album at Omega Lab, a "green" digital recording studio located in a tent perched on top of a mountain in the unincorporated hamlet of Pasquo, Tennessee, outside of his adopted hometown of Nashville. Despite the studio's high fidelity capabilities, it runs on less power than the average hair dryer. It was there that Drozdowski experimented with swirling, fuzzed-out tones, reversing parts and layering others sometimes seven guitars deep. The result is an album that blends the past and the future, the Delta and the city, Earth and Hell, into one singular, stirring, utterly riveting sound.